I got myself a new toy earlier this summer: The Xperia Tablet Z, the newest 10 inch tablet from Sony. It is fast, light, very thin and water and dust resistant. Below is my review, with occasional comparisons to the Nexus 7, my other tablet. The design is gorgeous. It's a squared-off, flat black slab of a tablet. It's really very thin; so thin that I think of it as a thick sheet rather than as a flat box. And it is almost unbelievably light. In fact, the first time I picked one up in a store, I thought it was a nonfunctional display model; one of those that's just a shell with nothing inside. All edges and corners are covered by a thin bezel in softer, matte plastic that improves your grip on the tablet and does a decent job at avoiding small dings and scratches. It is effectively a bumper case wrapped around the tablet, but so thin and unobtrusive you forget it's there. Tablet Z from the side (artists impression (proportions are to scale)). The tablet is water and dust resistant. Not that I want it with me in the shower or anything, but it gives me some peace of mind. I can get caught out in the rain, for instance, and not worry that the tablet gets wet. It also makes it easy to remove fingerprints and stains with a drop of detergent and some water. Gently slosh around the soapy water over the screen with your hand, then rinse the tablet off in the sink. Do note that you're not supposed to use detergents on it, but I figure only a drop on the front screen is unlikely to do any damage. Water and dust resistant means all ports are covered with plastic flaps. It can be a little annoying to find and pop open a small black flap along a black edge of a black tablet to get at the USB port or headhpone jack. But the flaps are solid plastic that open easily and close with a reassuring snap, not some fiddly rubber grommets. Both my phone and my Nexus 7 have bad USB ports and headphone jacks because of the dust and crud they've picked up over time; covered ports should help me avoid that problem. From left: the Tablet Z; iPad Mini; Nexus 7; and Galaxy Nexus. The Z and the iPad have the best screens with good colour and viewing angles, though the Z has far better resolution, looks crisper and fits a lot more information on screen. The Nexus 7 has lower contrast and worse viewing angles, though the colour rendition is still OK. The Galaxy Nexus screen is the worst, with a greenish tint and low contrast. When the screen is off it's a homogenous black surface, only slightly marred by a Sony logo. As you turn it on you get a rich, vibrant display shining out from that deep surface that looks great from almost any angle. It has plenty of contrast and skews slightly warm; that's not a bad thing in general, as warm pictures tend to look more lively. The contrast and saturation is a little too much for me, but fortunately you can turn off the extra enhancement in the settings. The screen has somewhat higher pixel density than the Nexus 7, but a bit lower than the "retina" iPad and much lower than the Nexus 10. If I wear my close-up glasses and really try, I can sort-of kind-of note jaggies on website text on the Nexus 7, but on the Z I can not. Text and graphics look completely crisp and clear at all times. The screen is quite reflective, and that's more of a problem than it is with a phone or a smaller tablet. There's a lot more surface area to catch and mirror stray lights in the background. This is as good as the camera gets. Taken using the "HDR" function to keep detail both in the clouds and in the shadows, then post-processed in Gimp. It's only fair to do so, I think; after all, you want to see how good you can make the images, and the images on the net that you compare with are normally post-processed as well. There's a camera. It takes pictures. The camera app is quite good, with a fair amount of manual settings available. The camera itself is much like any mobile camera, with loss of small detail and low dynamic range. The software is not that bad though; it doesn't oversharpen the images and there's less smearing from the noise removal than in many other mobile cameras. With that said, do you really want to be seen in public taking pictures with a 10" tablet? Holding it in front of you like someone waving a "will work for food"-sign at people passing by? I didn't think so. The normal use for the front-facing camera is more likely to be scanning the occasional QR code or as a back-up camera if your phone dies. It takes panoramas too. Here's a cropped one with the view from my desk. There's a couple of ships and a crane barge out on the sea towards the left; you'll have to take my word for it. There's a built-in FM radio that uses the the headphone cord as antenna. It works well - you don't need to listen through your headphones, just have them connected — and reception seems decent. Now, if there was anything actually worth listening to on the Japanese radio waves. 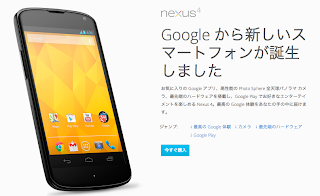 The Z comes with Android 4.1.2, though the 4.2 update is rolling out in a matter of weeks, and Sony has stated that 4.3 will come in the not too distant future. This is for the Wifi and Sony-supplied LTE models of course; I wouldn't expect updates to be as fast for the Docomo-specific LTE version. Sony has added their own skin on the tablet. But unlike most maker skins this is subtle and unobtrusive, and many of the tweaks are true improvements on the basic Android design. There's some extra cruft, but most of it can be uninstalled. 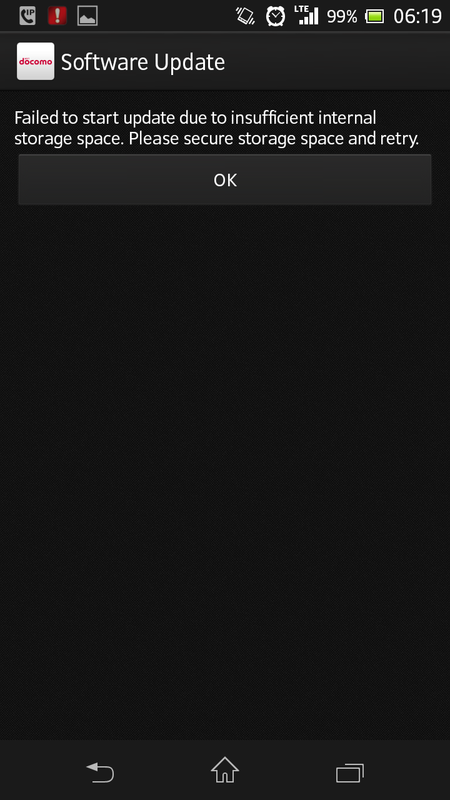 Some apps are in ROM and can't be uninstalled as such, but Android lets you disable such apps completely. They don't run, don't take up any storage or RAM, and don't get updated. It's effectively the same as uninstalling them. Some reviews have complained of slowness and choppiness, and indeed, when I first started the Z the home screen was a bit stuttery. The reason is simple: On first boot the home screens are loaded to the gills with active widgets that showcase everything Sony has to offer. I suspect the engineers designed a good, solid interface that works smoothly in normal use. Close to launch the marketing department decided that filling up the screens with widgets was the right way to sell the tablet and Sony services. Remove all widgets you don't want from the home screen and any slowness is gone. Their "small apps" is really useful. You have a launcher in the bottom bar where you can pop up a list of small apps at any time, no matter what else you're doing. There's a calculator, note-taking app, clipboard manager, a small version of the Chrome web browser and so on. There's more small apps available on the Play market (the Toggle Switcher app is very useful), and you can add any homescreen widget as a small app as well. This is great when you write notes during a teleconference or chat session, or you look up some info on the web while waiting for daybreak in Minecraft. It's absolutely brilliant in fact; I use this all the time and I hope something like it will find its way into Android itself. 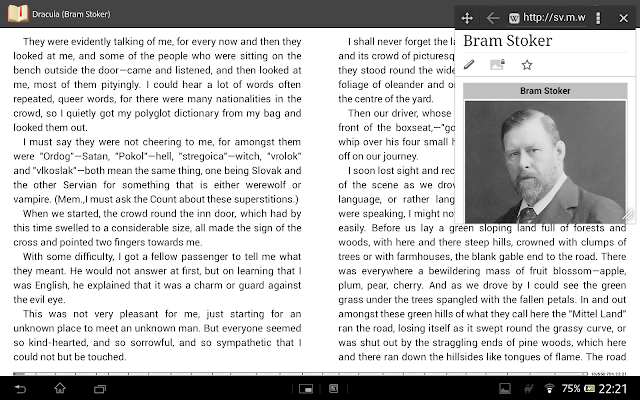 Reading "Dracula", with a small Chrome browser window open at Wikipedia's entry for Bram Stoker. 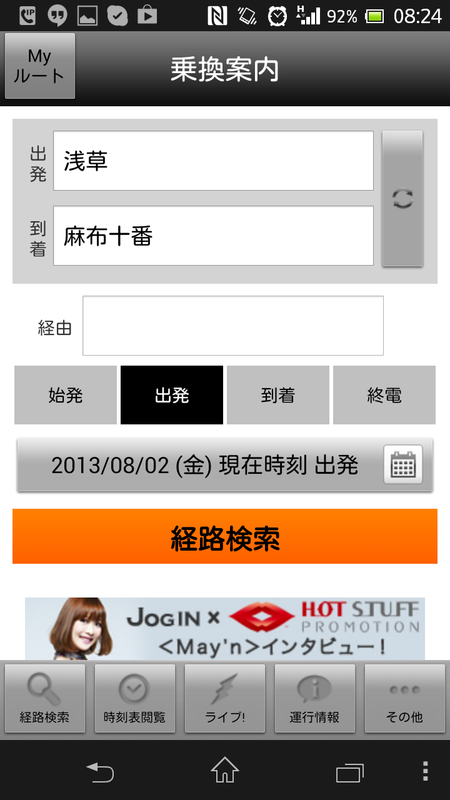 The floating window can be moved and resized at will, and the app will remember its state between activations. There's an IR transmitter and remote control app. I tried setting it up for our Sharp DVD/Hard drive recorder, and I got a basic working set-up after a few minutes. It's kind of cool, but doesn't strike me as terribly useful. We have a remote with real hardware buttons right there on the table after all. I'm not a heavy TV user though, so perhaps I'm missing the point. Smart Connect is good but a little frustrating. 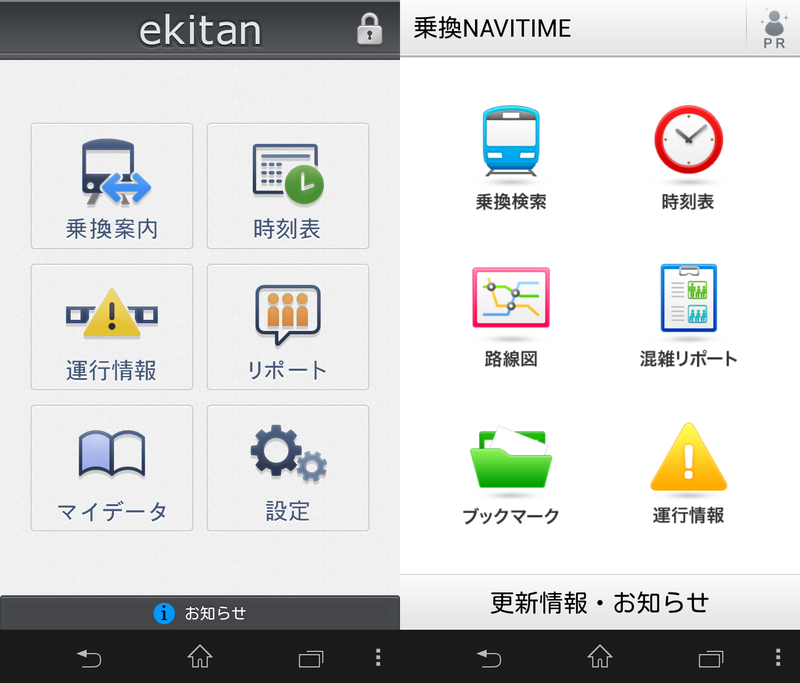 The app automates connection and disconnection of devices like keyboards and earphones in a convenient way. It can also react to things such as the cradle and the charging cable. You can set it to open a specific app when connecting a Bluetooth keyboard for instance, or turn off the sound when when the charger is plugged in at night. 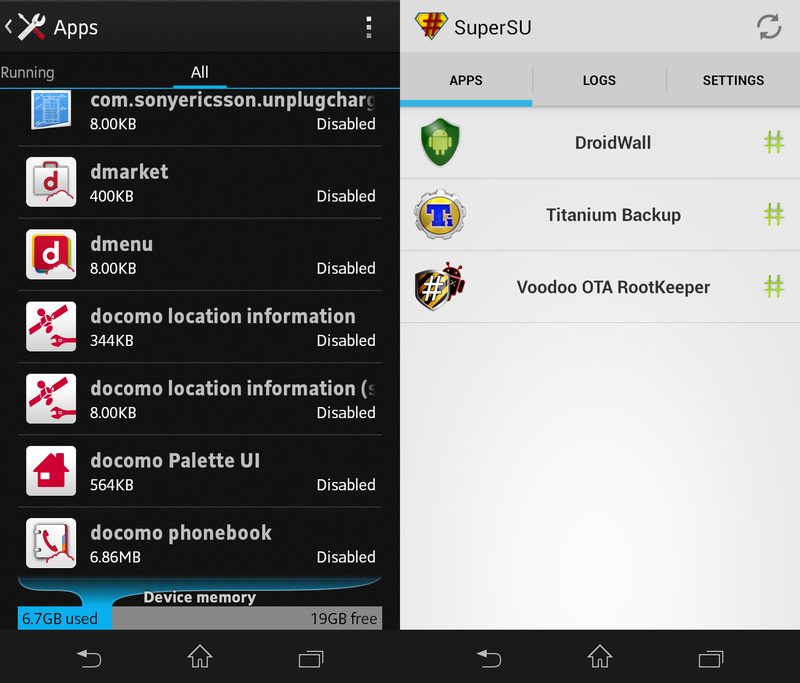 The app is almost a real activity automation application such as Tasker or Llama, but with a really well-designed UI. It can react to and do so many things already, but for activity automation it has crippling omissions; you can't react to a particular Wifi network being available, for instance. Crippling, that is, if you think of this as an automator. But this is of course aimed specifically at connecting devices, and that it does very well. I do wish that Sony would make it a real automation application in the future. I've disabled all Facebook-, Twitter- and Sony Play Memories-related services in the "Apps" tab in the settings since I don't use them. "Socialife" seems a decent RSS feed reader and aggregator, but as I use Tiny Tiny RSS already I disabled that too. I don't disable them for the memory but to limit the number of things that wake up the tablet periodically to conserve battery. They're all trivial to enable again should I want them. There's some good improvements and neat touches. You can double-tap on the screen to turn it on, for instance, rather than use the power button. 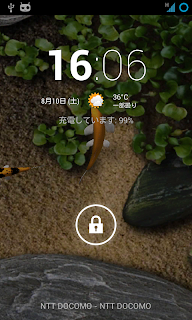 The screen unlock is a simple upward swipe anywhere on the screen that triggers a ripple-like effect. Together, a simple tap-tap-swipe anywhere will activate your tablet; easier and faster than having to find a power button, then find an on-screen unlock target. 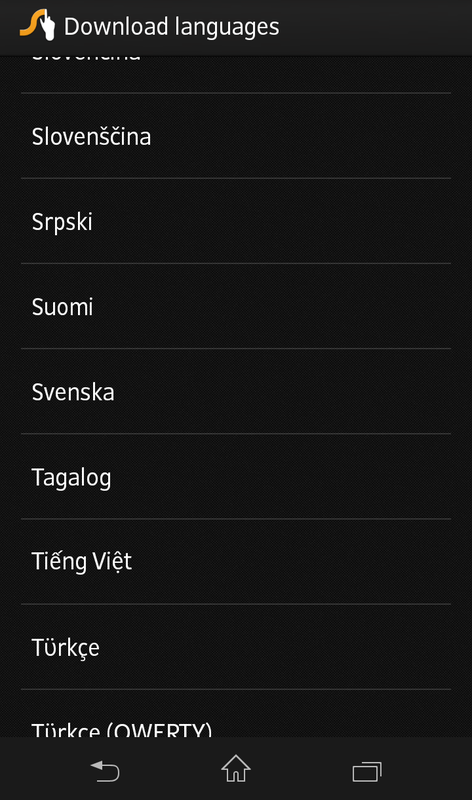 The POBox on-screen keyboard works well (a Swedish dictionary is included) and includes swiping. 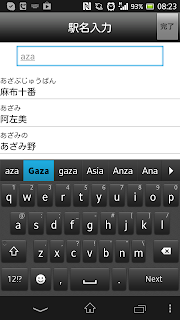 For Japanese I ultimately prefer Google's Japanese keyboard; I'm used to it as much as anything. 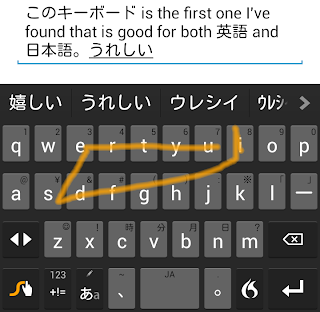 The larger screen makes an on-screen keyboard a lot more useful than on smaller devices, and I can tap out fairly long emails without much frustration. The improvement even over the Nexus 7 really is surprisingly large. You still have no tactile feedback so while I can do email with the on-screen keyboard I'd still insist on a real keyboard for longer texts. 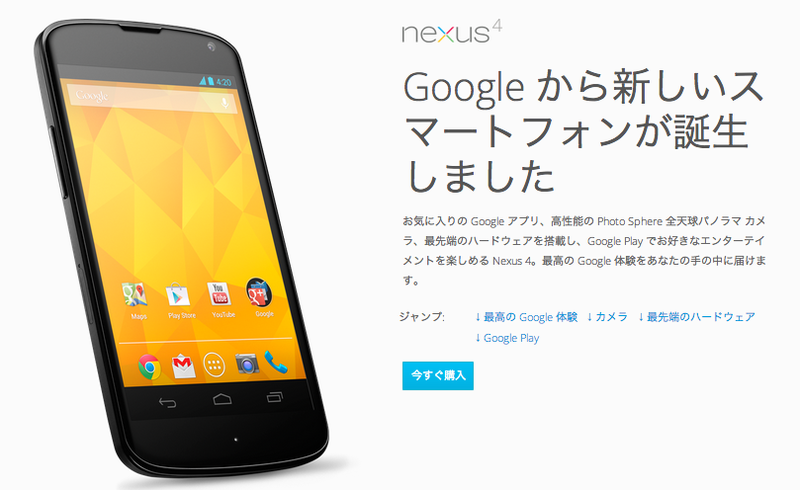 I have a Nexus 7 already, and use it extensively. So why get a second, larger tablet? 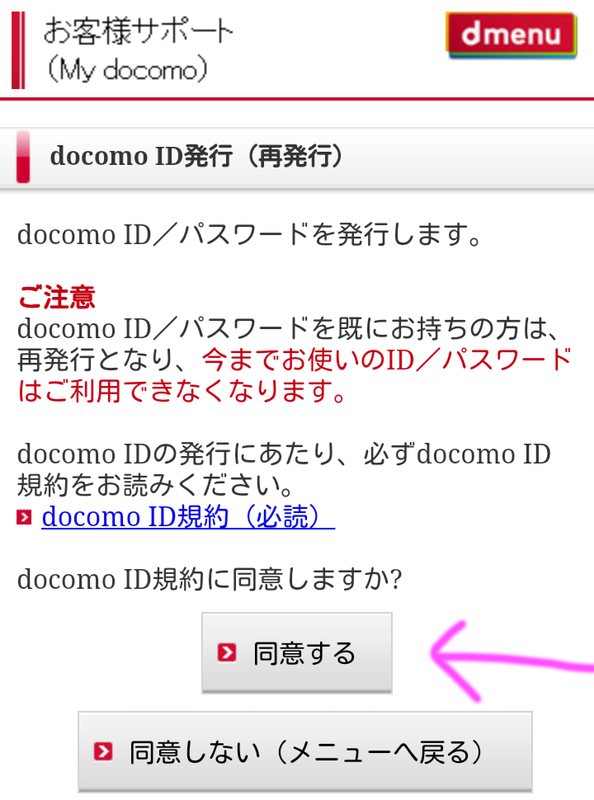 First, I want to read research papers and other PDF documents, and a 7" tablet is just too small for that. I'd also like to try to do more intensive writing-related tasks such as real email, light paper writing, as well as use for remote login. If possible I want to try using it for presentations as well so I could leave my laptop at home for most short business trips. And of course it should be good for games and general web surfing. 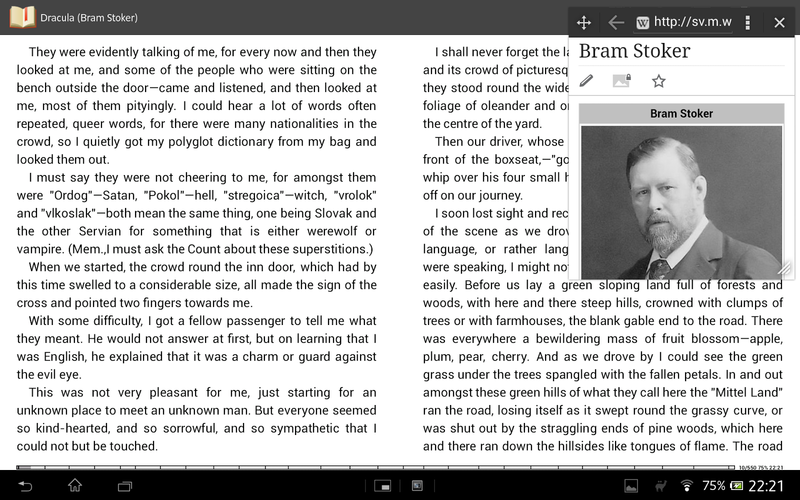 The tablet is quite good for reading PDFs. Books and single-column research papers fit neatly in portrait orientation, and both math and figures are crisp and easy to read. Double-column papers are readable but just a little small in portrait orientation for my eyes. If I zoom in to read one column at a time or switch to landscape they're very easy to read and follow. A double-column paper in portrait orientation. Click on it for the full size. The small text in the equations, table and captions is all crisp and clear, but a bit small for my eyes. 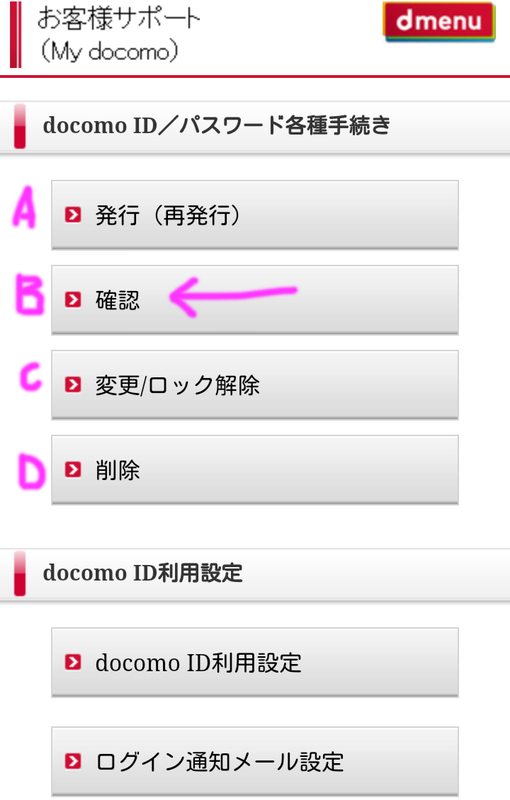 Switch to landscape orientation and both text and figures are very large and easy to read. The text is actually a fair bit larger than the printed copy, and I can neatly fit half a page at a time on screen. This is easier to read for me than the printout. 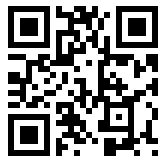 The Sony notepad mini app is useful here. It pops up in a small separate window in a corner and lets you take notes while reading the paper. You can even add freehand drawings. Unfortunately, the only ways to export the notes are as straight text (losing all formatting and sketches) or as PNG images. Some slightly more structured format would be welcome (even markdown to keep the text formatting would be a big improvement), along with a way to do boxes-and-arrows style structured drawings. I there was a PDF reader better adapted for this particular use. Acrobat Reader works OK, but lacks a number of features. Ideally it should let you zoom into either left and right, or top and bottom halves of a document, then treat each half of the document as a page, so that a click forward would skip to the next half of the page, not the next page. And it should let you have multiple PDFs open and easily switch between them for comparisons. I tried editing a PDF as well. I had an eight-page DPF document — a response to reviewers for a paper — and as a coauthor I had some comments and suggested edits for the first author1. So I opened the PDF with Adobe Reader, then used the annotation tools to mark text and add my comments and suggestions. Saved the changes, then emailed the file back to the first author (you need to install a file manager such as Astro to pick PDFs as an attachment in Gmail). This worked quite well. I spent 45 minutes on the couch doing the entire round of proofreading and commenting with the tablet, and I never once felt like giving up and use my laptop. 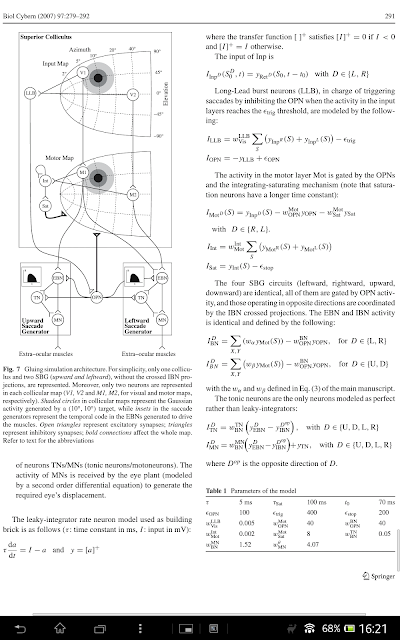 Reading and editing PDFs works well with the Z. Mission accomplished as far as I'm concerned. Fiction ebooks are readable, though a little awkward on the Z. The tablet is light enough to hold for long periods but the screen is on the large side. In portrait you get fairly large text or long lines. You can read books in two-page format in landscape orientation (see the Screenshot earlier), but only if you're comfortable with small text. It's not bad, but for fiction I prefer the even lighter, paperback-sized Nexus 7. Non-fiction texts work better. Graphs, equations and code examples are large and clear and you can fit a lot of information on the screen. Non-fiction books are usually edited and laid out with a larger paper size in mind, so they just work better on a large tablet even with a reflowable format such as ePub. The tablet is especially handy when you keep a page open for reference while you're doing something else. It works great for viewing recipes while you're cooking, and you can rinse off any food stains and gunk in the sink afterwards. 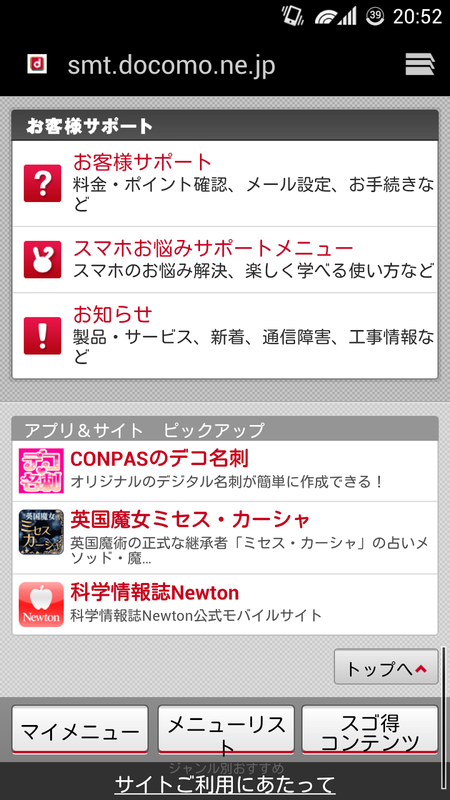 The Asahi newspaper app works great on it. As a working tool it is quite good. The tablet works well for remote logins. I use VX ConnectBot for now, though I also have Juice SSH installed. With an on-screen keyboard the tablet is useful for small tasks such as running a software upgrade, say, or checking on the progress of a long-running simulation. With a hardware Bluetooth keyboard I can use this for real work. I already use Screen or Tmux for persistent logins, Vim for editing and so on, and I can use it all as usual with the Z. The tablet Z connected to the Microsoft Wedge keyboard. The keyboard cover folds up to become a tablet stand; a neat touch. The whole thing is the size of a netbook, and you can even have the keyboard in your lap if you're truly pressed for space. On the other hand, with the keyboard you do need a table of some kind for the tablet; a true laptop it is not. The Hacker's Keyboard is a good on-screen keyboard for remote logins; the lack of arrow keys and Escape is a larger drawback of most on-screen keyboards than the lack of screen space, and this solves that issue for you. Still, for anything more than a few minutes of work at a time you really want a real keyboard with proper tactile feedback, and whatever you think of Microsoft business practices or software, their peripherals are very good. The Mobile Wedge is no exception. While it's too small to rival the Lenovo laptop keyboard or my Happy Hacking Professional keyboard2, it is better than any other mobile keyboard I have tried. 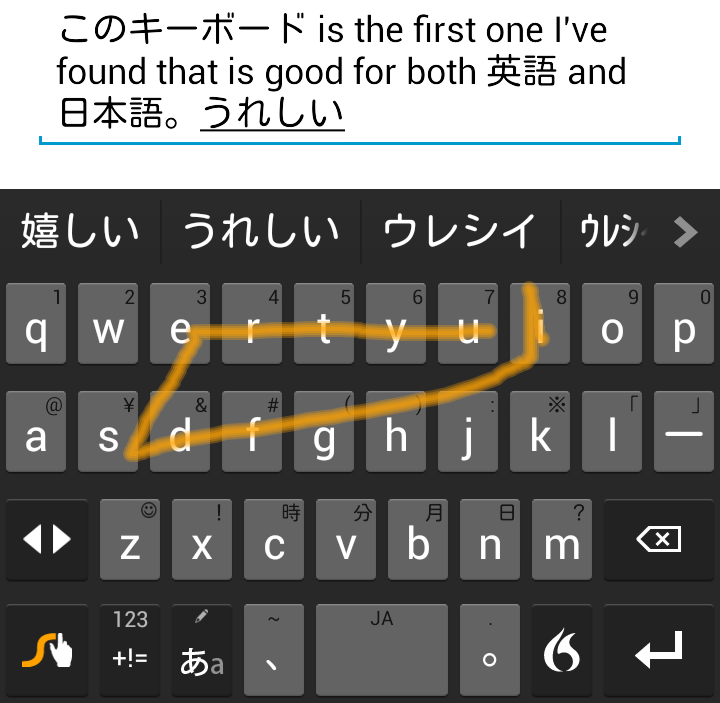 I would prefer a longer key travel, and the space bar could be a little more sensitive, but it works quite well. Teleconferencing works OK, by the way; camera and screen are all good enough, and the microphone seems to do its job. The speakers are fine for this, but you still want to use headphones if you can, to avoid audio feedback. I have yet to try doing presentations with the tablet. The minimal software is there — I can use Adobe Reader or some other PDF reader to show a presentation in PDF format, and Office Suite Pro can apparently show simple power-point presentations. But the tablet has only a HDMI output, and many places still require VGA connections to the projector. HDMI-to-VGA converters need to actively convert the signal so they're not cheap and need an external power source too. I'll continue to rely on my laptop for now. Games and entertainment is where this tablet really shines. Almost every game I've tried works really well, with smooth animations, beautiful graphics and good sound. Minecraft was really made for this; I haven't touched the desktop version since I got the Z. Humble Bundle games like SpaceChem and Broken Sword — too small on the N7 — work great on the Z. I've replayed World of Goo once again, just for the sheer pleasure of playing it on the large, beautiful screen. I don't watch movies or listen to music much, so I can't say how good it is for that. But youtube videos run flawlessly, and the screen is large enough to create an immersive experience. The corner-placed speakers are loud and clear, giving you nice stereo separation. I have no doubt it works well for that too. It's even surprisingly useful out on the street. My commute takes two hours every morning with a mix of walking, crowded subways and commuter trains. I often play Ingress along the way; it's a good proxy for any kind of outdoor use, such as following a map or looking up directions. My Nexus 7 really shines at this, but the Tablet Z works much better than I expected. Walking down the street or standing in the train you usually have only one hand free, so the natural way is to hold it in portrait orientation. It's light enough to hold for an extended time and the bezel is wide enough to give you a good grip. The screen is fairly readable outdoors in the sun if you crank up the brightness. On the down side you can view things, but can't really operate apps with one hand on such a large screen. Also, it's large enough that I worry I'll bump into people or things and drop it. With that said, I usually use the Z on the train nowadays — it's a pleasure to read the newspaper on it — though I still prefer the Nexus 7 when walking down the street or when I'm in the middle of a book. The subway is usually crowded enough that you can barely use a phone; a tablet of any kind is out of the question. I'll still bring my Nexus 7, especially for book reading, but the Z works just as well in practice. Battery life is good, by the way. My entire commute is two hours, and if I play Ingress (a known battery killer) on the way, the tablet is constantly connected to my Wifi router, the GPS is often active and the screen is on pretty much all the time. I read my RSS feeds, glance at the newspaper, and spend a fair amount of time in the Ingress client. The battery charge goes from 100% to 74% in that time. By comparison, my Nexus 7 (with a 9 month old battery) drains to 66% for exactly the same trip. If I don't use it for Ingress I usually have more than half a charge left when I come home at night, so battery life is not a problem in practice. What doesn't the tablet do, then? 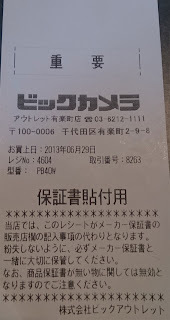 It does not do lunch. I often use a tablet while eating (yes mom, I still read at the table...), especially during lunch at work. There I need to pick up my food, carry the tray to my seat, and bring the empty tray to the kitchen when leaving. The Nexus 7 goes right into my back pocket and frees up my hands, but the Z is too large for that. Instead I have to carry it under the tray with one hand. Not convenient, and not safe. And it's rather big for a crowded lunch table too. I just use the N7 instead; or failing that, my phone. In short (too late for that, I realize), the Tablet Z is a thin, light, high-performance tablet that's a true pleasure to use. It's good for work-related tasks and for reading research papers; it's great for gaming; and it's light and svelte enough to use on your commute or out on the streets if you need to. After almost two months of heavy use I can say this has been one of the best purchases I have ever made. 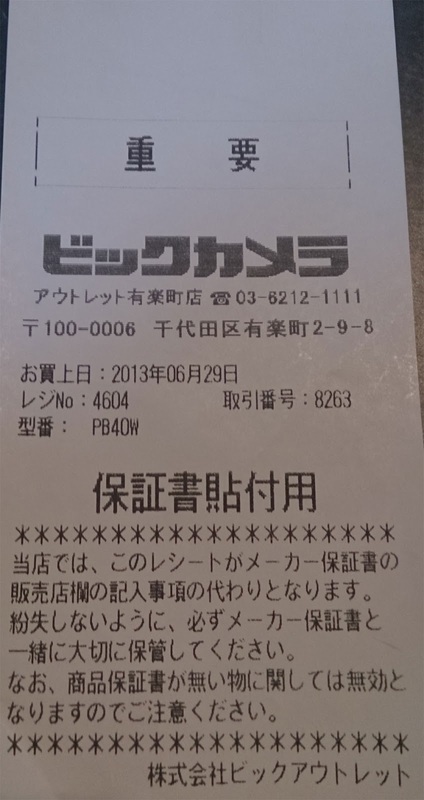 It's been worth every yen, and I'd buy it again in a heartbeat. #1 Yes, I was suggesting edits to a revision of the response to reviewers for their suggested edits for the revision of the actual paper. And people sometimes wonder why the academic publication process can take so much time. 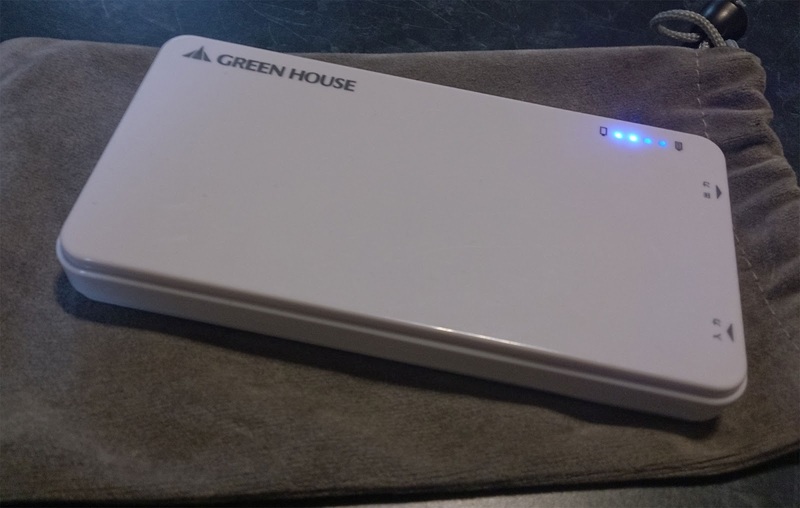 #2 It's probably never going to happen, but a portable, battery-powered bluetooth version of the Happy Hacking Professional would have me throwing yen bills at the manufacturer within seconds. I spend more time using keyboards every day than I do with any other thing so the ergonomics, comfort and function is really important. There are many good keyboards out there, but for me only a very few have really stood the test of time. The IBM Model M; the current Lenovo chicklet keyboard; and the Happy Hacking Professional. We often get questions about voice SIMs for visitors; this post will serve as the answer. 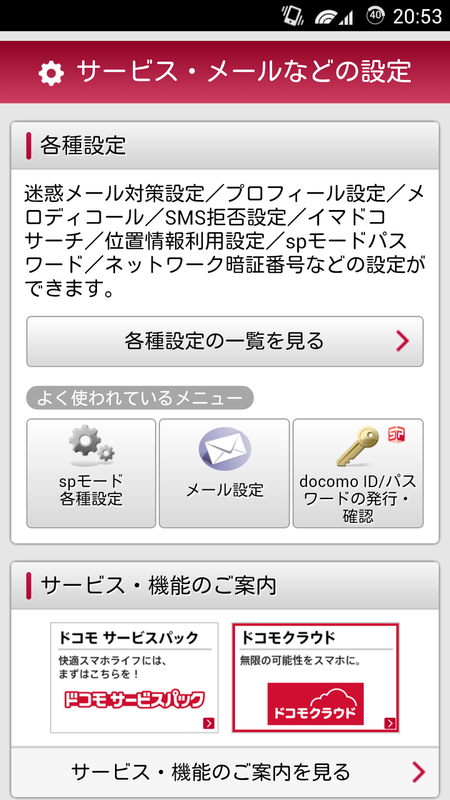 National law restricts mobile voice plans to residents of Japan. The only way for a visitor to get mobile voice service is to use a rental phone or SIM card. 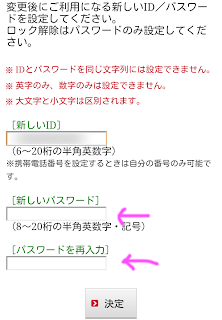 SIM cards can be complicated by the fact that many overseas Android smartphones don't display the required certification mark (giteki 技適) for radio transmitting devices, making them (technically) illegal to use in Japan. The reason that we don't have any posts or information on rental is because we consider it to be a total waste of money and can't recommend rentals whatsoever. 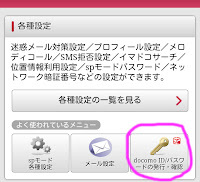 EVERYONE you would contact in Japan can receive your mail. 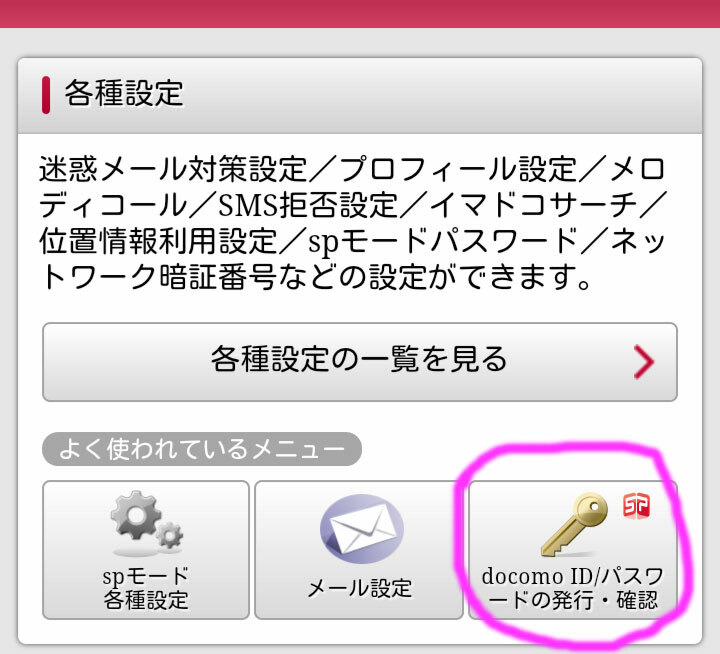 I don't mean SMS, I mean regular email. 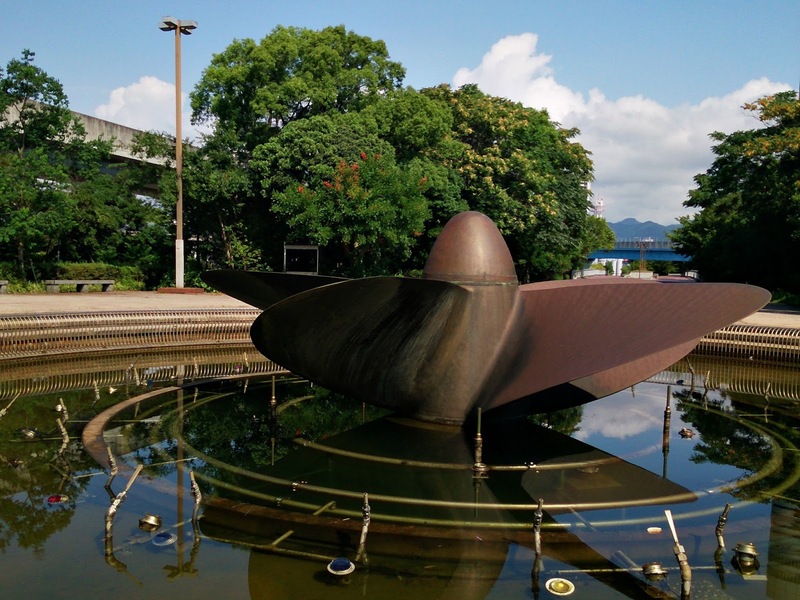 If you need to call back home, use skype or Google Hangouts or some other VoIP-based solution with free wifi (yes, Japan actually has that now at Starbuck, 7-11 and I think even some vending machines) or a data-only mobile plan because these carry no legal restrictions requiring residency. We recommend the JCI b-mobile visitor SIMs, which can be picked up at the airport, for data connectivity that is a balance between value and ease of set up. If you want the absolute best deal, get a pre-paid b-mobile SIM from a large electronics retailer for about ¥3,000 for 30 days. These are a better value but require activation with a Japanese mobile phone. 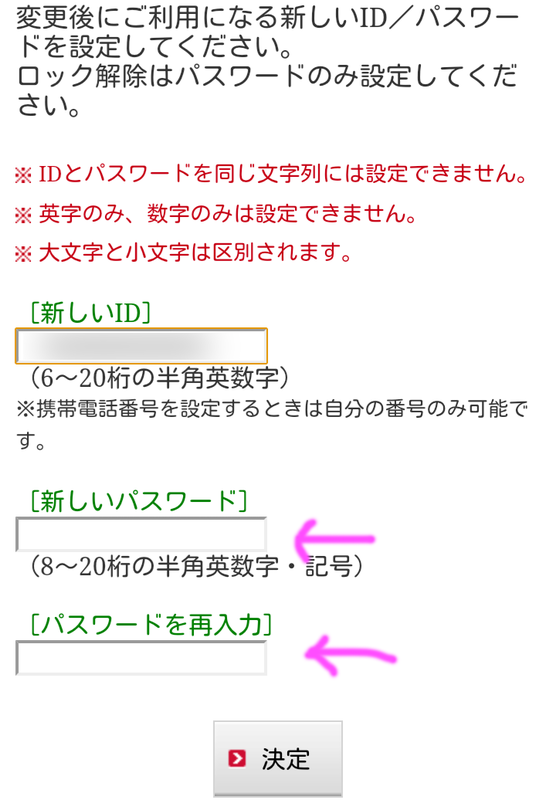 Regarding the lack of certification mark on overseas phones, note the usage of the word technically above. You'll need a phone that support UMTS-2100 MHz (Band 1). DISCLAIMER: do this at your own risk. It will void your warranty. Doing this is trivial. 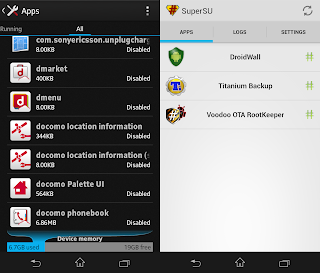 The needed files are available through XDA Developers. I did this on the original SO-04E firmware (4.1.2, build 10.1.1.D.0.179). 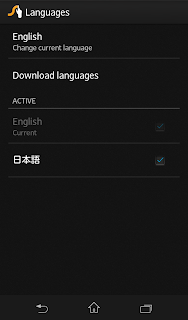 To date, the SO-04E has received two OTA updates, this method is compatible with the first update (build 10.1.1.D.2.26), but not yet with the second update (build 10.1.1.D.2.31), though support should be coming soon. The developer of these rooting scripts only needs the build.prop and kernel.sin files from a new build to add support, and those have already been submitted. If you are currently running a supported build (confirm build in Settings > About Phone) then use Root Keeper to preserve root privileges when upgrading to the latest version by OTA. However, if you use the Sony desktop update tool, you will lose root, and root keeper is not compatible with Andorid 4.3 (though this has not yet been announced for the SO-04E). 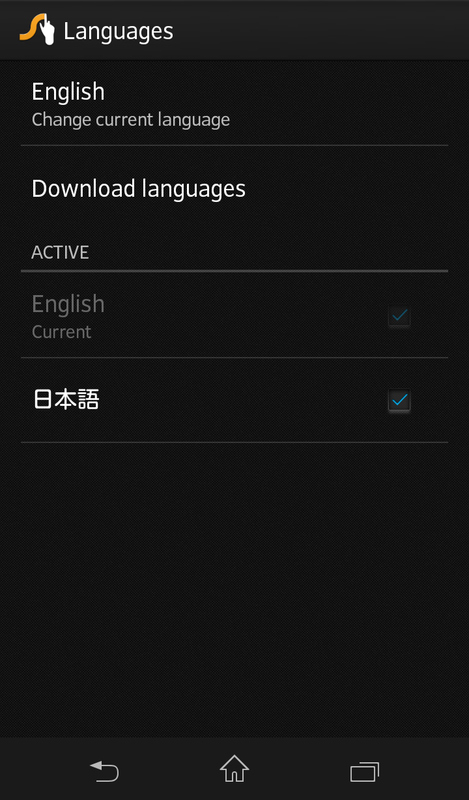 It has been reported that for the Xperia Z, this no longer works on 4.2. The process becomes much more complicated, so if you plan to root your Xperia, do it before the update to 4.2 rolls out, then use Root Keeper. 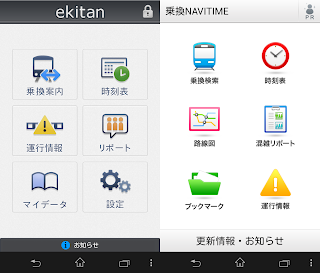 4.2 has been announced for the Xperia Z, and we can only assume that this exploit will also be fixed for the Xperia A. 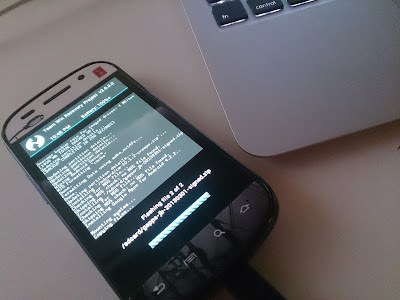 Step 1: Down and unzip the "DooMLoRD Easy Rooting Toolkit" from XDA. All dependencies are included. Step 2: From Settings, make sure you have turned on 1) USB Debugging in Developer Options and 2) installing apps from unknown sources in Security. Step 3: connect the phone by USB, navigate to the folder you unzipped, and execute the appropriate script for your environment, e.g., on a mac, runme_mac.sh. 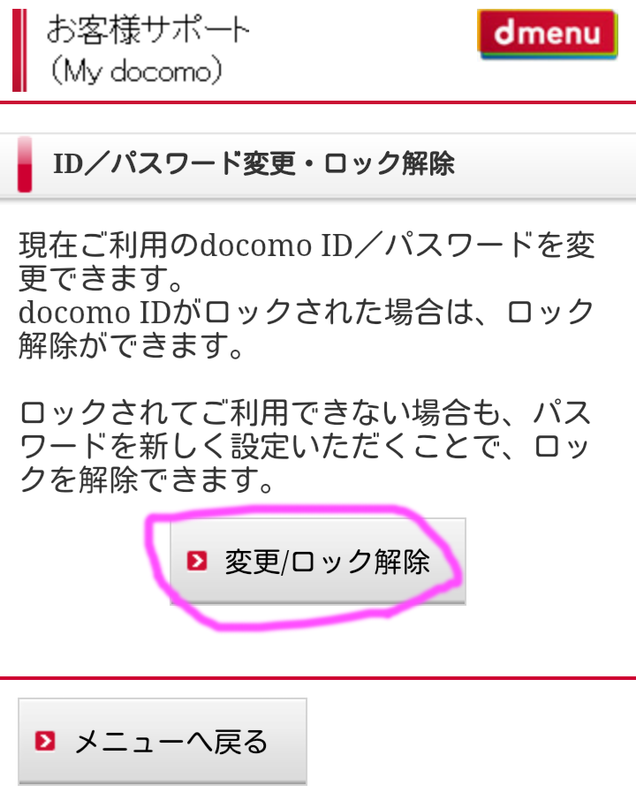 Install Titanium Backup and disable all the redundant Docomo junk, but be careful that you don't disable the software update, or some of the other docomo stuff needed to receive OTA updates. 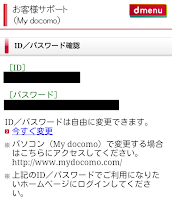 DO NOT UNINSTALL THE DOCOMO SYSTEM APPS. It appears that the OTA checks for system applications, but I'm not sure if it checks for all or just those required for the update. I had disabled everything and got the following error when attempting to OTA update. 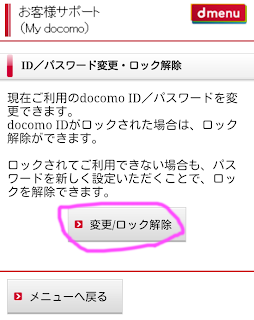 At first, I thought this was because I had disabled some of the cryptically-named system software, like "docomo service" or "docomo device manager", (as shown below) that was needed to handle the OTA update file. However, after reenabling these, the OTA still resulted in the same "insufficient internal storage space" error. 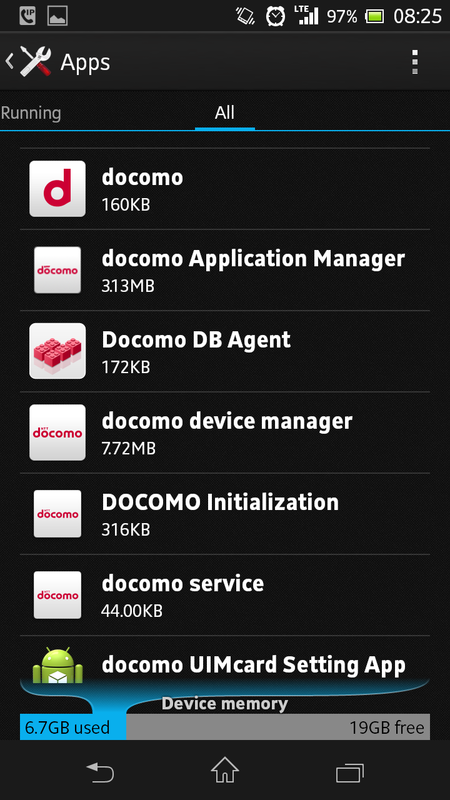 I then reenabled all Docomo apps, and the OTA still failed. So I rebooted. Then it worked, but I am left unable to determine exactly what fixed it, the reboot, or reenabling everything. 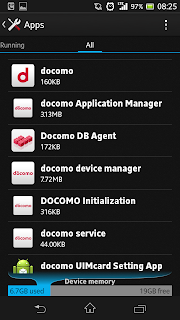 These are the Docomo apps that I have left enabled. 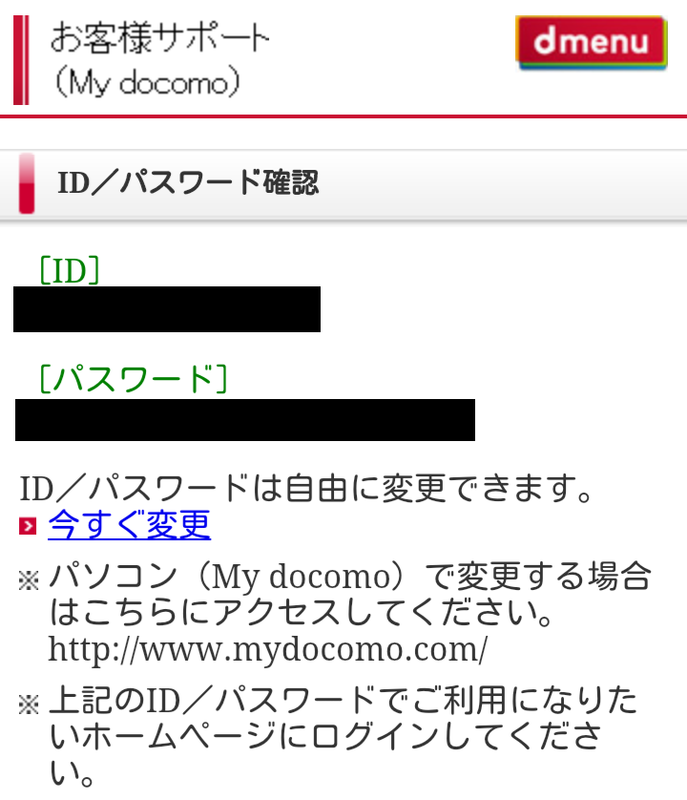 "docomo" is the docomo account used for sp-mode stuff. Perhaps we'll experiment and figure out just which of these are actually needed. Every time the Xperia A is unplugged from a charger, an ecologically conscience and thoroughly annoying notification pops up, reminding you to "unplug from socket to save energy". 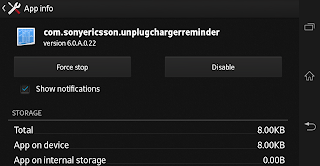 To make it stop, go to Settings > apps > all, rotate your phone to landscape mode so that longer names are fully displayed, and scroll down to com.sonyericsson.unplugchargerreminder. 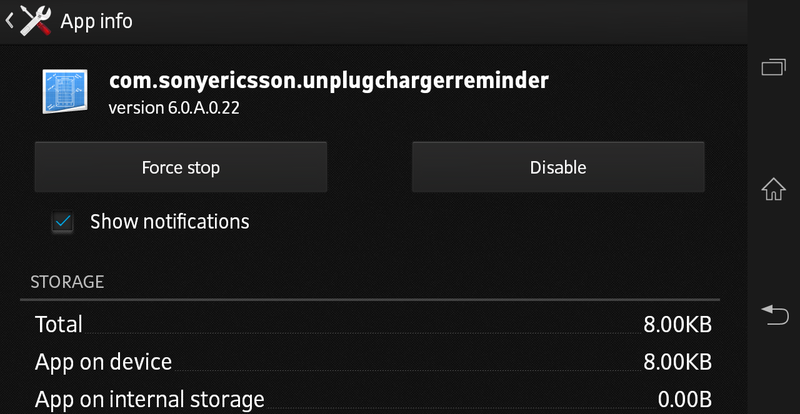 Either disable it outright or just uncheck the "shown notifications" option, and of course don't forget to unplug your chargers from the wall. 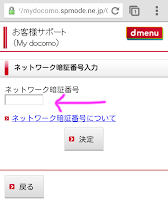 Go to the docomo portal "d menu" on your phone's browser at https://smt.docomo.ne.jp/ - it might work with Chrome too, but I recommend using the regular Android browser to be on the safe side. 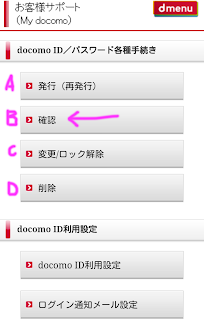 Here you can change or retrieve your WiFi username and password for use in Step 3. 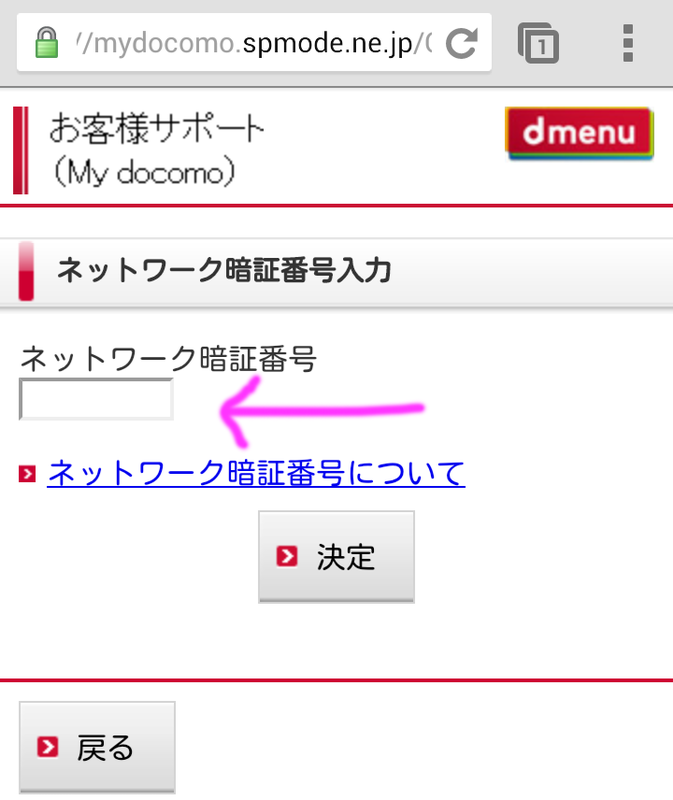 Enter your sp-mode WiFi username as "jmaurice-spmode" if your username is "jmaurice", with your sp-mode WiFi password from step 2. 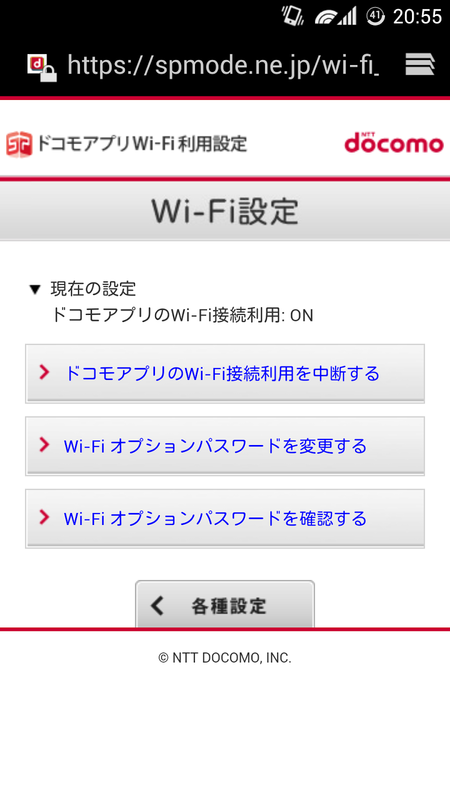 You may have to install a new certificate when using WiFi for the first time at a new location. 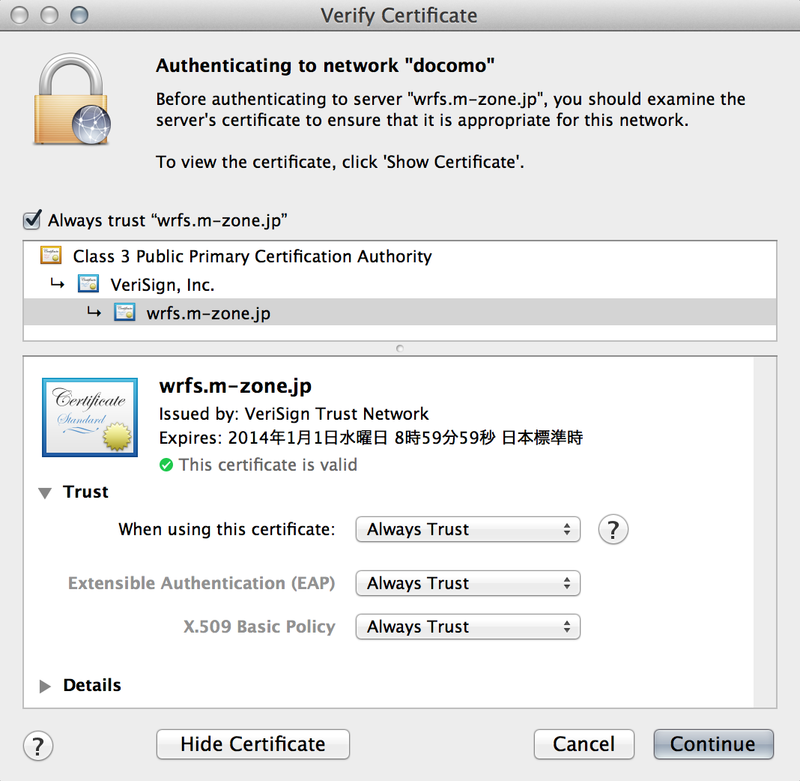 For example, train stations and Starbucks typically use different certificates. Note that you can only use sp-mode WiFi from one device at a time, so your phone has to be on 4G while you use WiFi on your laptop. 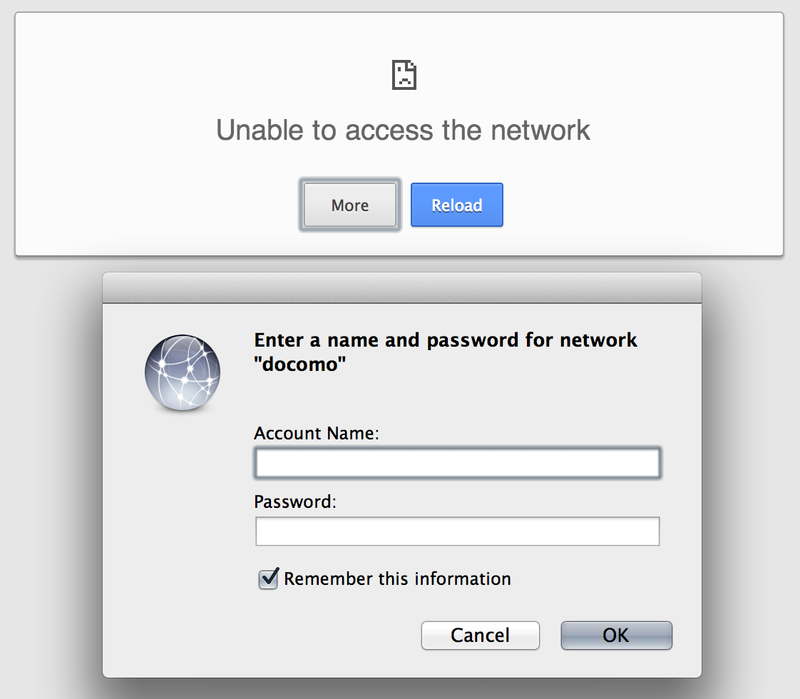 You might get disconnected from time to time, depending on how much docomo likes you or not.